It is night in the Western region of the human village, a misty cloud floats across the big full moon and there is an eerie silence. Suddenly the screams of a young woman cause the villagers to emerge from their huts to investigate. A woman runs toward the village men as she cries out, "Help, Please anyone!!" A man comes to her aid, taking her by the arms, "Calm down, what's the problem?" The woman is frantic, " Please, it's going to kill him!" Suddenly there is a commotion and the screams of a man coming from the village water mill. The villager there to assist the woman yells out to the other males in the village, "Grab whatever weapons you can find men and hurry.... someone needs help!!" A few other men grab what weapons they have in their huts and run to the area of the water mill where the man's scream was heard, the young woman accompanies them, also leading the way. The young woman cries as she explains, "My brother and I came here to fill our water bottles when a demon ambushed us, my brother jumped in front of me and told me to run. Last I saw, the demon was approaching to kill him." The men look, slowly approaching the water mill prepared for a demon to give them a fight but instead they see only a young man lying on the ground in pain and bleeding from his wounds. The young woman rushes to comfort him as one of the villagers asks him, "Are you alright? Where is the demon?" They help sit the wounded young man up as he responds painfully, "It flew away after only clawing me." The male villager says, "We must have scared it off in time." the young man replies, "No, it simply clawed me then flew off many moments before you showed up." The young man's shirt is ripped and bloody, he removes it and the villagers are shocked to see some sort of symbol created from the large bloody scratch. The village man replies, "Hmm...that's odd. Nevermind, let's get your wounds bandaged." They all help the young man to his feet and assist him in walking back to the huts when he suddenly begins to moan and scream in extreme pain. As he does the other male villagers and the young woman all watch in horror as he begins to transform into a hideous winged creature with claws and fangs as sharp as daggers. The creature then darts his eyes sharply at the group of villagers standing there watching in amazement as he lets out a frightening roar and flies off. The young woman tries to run after him as she yells, "Brother!!" The men hold her back as one of them says, "He is no longer your brother, no longer human, he will kill you." Four days later, Rin and Kohaku are at Lady Sango's hut enjoying a small lunch and talking. Kohaku compliments his sister's wonderful meal as he says,"Sango, your cooking has gotten better over the years." she responds, " Well, that's what having a family will do to a woman." Rin adds, "I hope I'm as good at preparing meals as you are someday when I have a family of my own. Lady Kaede has been teaching me well." Kohaku assures her, "You already cook well Rin, you've been doing so since you were little. You have more expertise than you realize." A knock on Sango's hut door takes her away from the conversation as Rin continues, "Well, I suppose so. Did you enjoy the rice and fish I prepared for you a few nights ago?" he replies, "It was incredible Rin, the rice was perfectly light and fluffy. don't tell Sango this but her rice tends to be a bit mushy and sticky at times." Sango yells, "KOHAKU!!" he jumps and yelps in fright thinking his sister heard his comment regarding her cooking but she continues, "There is a man here to see you and Rin!" he replies, "Oh, let him in sister." The man sits and is given a cup of tea as he explains why he is there, "I heard that you all are demon slayers, our village is in dire need of help. For the past three nights a strange demon has been coming into the village and attacking in a most peculiar way. Clawing some strange markings on the victims and then fleeing." Kohaku inquires, "He doesn't kill them? He only leaves a marking?" the man continues, "Yes, a strange symbol of some sort on the chest or back of every victim but that is not all. Within moments the victim turns into a horrible demon and comes back the next night with the previous demons striking double the amounts of men. They are multiplying, if something isn't done soon our village will be doomed." Rin replies, "That's awful." The villager asks, "Please, the villagers have come together, gathering all their valuables and have reached a generous sum as payment. When can you come to the village to destroy these demons? As far as I know, there is a total of 8 of these demons created now." Rin exclaims, "I say we go tonight, those 8 demons will claw 8 more villagers causing the demons to multiply into 16 over night." Kohaku agrees, "Alright but we will need thick armor this time. It would seem the demons only claw the back and chest of the victims for some reason, If we armor up those areas of our bodies...they should not be able to harm us. Have the people in the village do the same, they can use wood boards or some form of iron metal but they must keep themselves covered." The villager is most gracious and leaves immediately to inform the people of the village. Meanwhile, Sesshomaru and his young son Heroshya are walking into the castle as they speak about the future. Sesshomaru inquires, "Do you not want to reside here in the castle?" Heroshya responds, "I won't, unless mother will be here as well." Sesshomaru replies, "We've had this discussion before." Heroshya responds, "Then, I'd rather remain with my mother. I won't leave her to be alone." Sesshomaru replies, "We are demons Heroshya, What is loneliness to us?" Heroshya explains, "She may be a demon, but I am her son and she would be unhappy if I were not around." Sesshomaru thinks a moment and replies as he sits at the thone, "I see." Heroshya knows the answer to his next question but cannot resist asking, "Father, why can't we all 3 live in the castle as a royal demon family?" Sesshomaru does not respond; after a moment, Heroshya narrows his eyes and says, "It's that pathetic human...isn't it? You want her here instead of my mother." Sesshomaru replies in a raised voice, "Enough, I will not be questioned!" He continues, "Heroshya, you are my son therefore this castle belongs to you as well. There will be a large quarters for you and it will remain that way as long as I am ruler here. Everything here is yours if you so choose to have it." Heroshya begins to speak again, " Father..." his sentence is interrupted by Jaken, "Lord Sesshomaru..." he is running toward the throne and there are some of Sesshomaru's demon servants also walking swiftly behind Jaken that have taken two unfamiliar demons not of the empire captive. Jaken continues, "Milord, We have found demon spies on the grounds!" Sesshomaru replies, "Is that so?" He looks and there is a male demon whom is in full true demon form while the female is in a beautiful humanoid form however unable to disguise her tail and wings. Sesshomaru stands and walks up closer, he asks the male, "What region do you serve?" The demon replies with anger, "Damn you Sesshomaru, I will devulge no information that you can use against my master, I will remain silent for his sake!" Sesshomaru unsheaths his sword and responds, "Then you will die for him as well." In the blink of an eye, Buksaiga slices the male demon in half at the stomach. The demon that was holding the spy by the arms jumps and yelps in fear of being so close to Lord Sesshomaru's deadly swing as he then begins removing the dead demon at once. Sesshomaru then looks at the female demon, Buksaiga is still in his hand as he asks her the same question, "What region do you serve?" She replies, "The Southern region." Sesshomaru then asks, "Why have you come here to the Western region? Do you intend to relay information about my empire to you ruler?" The female demon replies, "Great Lord Sesshomaru, I am loyal to my master and bound to keep his agenda confidential. If I must suffer the same fate as my comrade, then so be it but I will not betray my master." 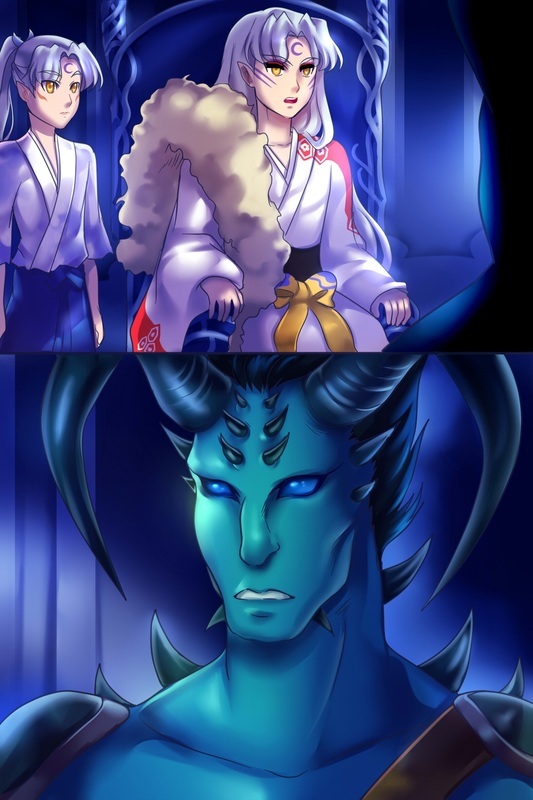 The demon that is holding the female spy by her arms, stands back to avoid the powerful swing of the sword but Sesshomaru only stares at the demon for a moment before instructing his servants, "Take this intruder to the lower chamber of the castle, chain and guard her while I ponder her fate." The demon servants do as ordered as Heroshya informs, "You should have killed her father, she is a spy." Sesshomaru informs his son, "You have much to learn about being a ruler....This demon is my property now, I can keep her as an additional servant or slave If I so choose to." Jaken asks, "Milord, what will you do?" Sesshomaru orders Jaken, "Send a demon emissary to the Southern ruler, Inform that his servant is being held prisoner here. If the servant is of any value to him, he must come here to the West and speak with me directly." Jaken bows, "Yes, right away Milord." Back at Lady Keade's hut, Rin is dressed in her demon slayer outfit and is carefully placing her armor on, making sure it is extra secure, it is made of iron and very heavy but she tries to get used to wearing it while at the same time trying to figure out where she will keep her weapons. She thinks: I guess I'll have to carry my Naginta and keep the slingshot nearby under my armor. Lady Kaede watches her in the door way, "Rin, I don't like this one bit...this demon sounds very dangerous." Rin assures her, "Granny don't worry, Kohaku and I are very well prepared." Keade asks, "Still, what would Sesshomaru say if he were to visit and you have been transformed into a beastly demon?" Rin's eyes raise with worry for a moment as she inquires, "Granny...you won't tell him will you?" Keade shakes her head, "Of course not child, just please be careful." Rin says, "I will but I may not be back home tonight so don't look for me." She gives Keade a kiss on the cheek and heads off. Keade continues to watch, as Rin meets up with Kohaku right outside the hut and they both begin walking off. As they walk, Rin inquires about the demon, "I've never heard of a demon attacking but not killing it's victim, why do you think it's keeping them alive?" Kohaku informs, "It seems as if the main demon may be trying to clone more of his kind or something, I'm not sure. One thing's certain, we have to find the head demon, the one that started all this and kill it." When they reach the village, it is shortly before night fall and all the villagers are wearing some form of protection around their chests and backs. They are so happy to see the demon slayers are here to save their village and they welcome Rin and Kohaku as the villager who requested their help says, "Please come this way, I will show you where you will both sleep tonight." Kohaku is showed to his hut and then Rin is accompanied to her hut where there is another young girl waiting. The villager explains, "You may stay here in this hut." He points to the young woman and continues, "She will see to your comfort, anything you need she will assist you." The young woman speaks, "Hello, My name is Chizu. I am so happy to have you here. We all hope you can destroy this evil demon, I especially hope you can kill him. He has taken my brother away from me." Rin inquires, "Do you mean your brother is now one of those demons that terrorize the village?" Chizu replies, "Sadly yes, It's like he is under the control of another, my brother normally could never harm anyone. I am not even able to talk to my brother because when the demons come, I can't tell which one is him." Rin tries to make her feel better, "We will do all we can, if there is a way to return your brother back to normal, we will do our best to make it happen. " Rin and Kohaku have dinner and tea with the villagers and then Rin is ready to retire for bed. She and Kohaku walk outside to go to their seperate huts and Rin says, "I would love to take a warm bath but, I'm not removing this armor for anything." Kohaku laughs, "That's wise Rin....Good night. " He gives her a kiss on the forehead and heads off to his own hut. She goes to her own hut and as she stated, she does not take the armor off to go to sleep. Late in the night it is once again very quiet in the village, all are asleep when suddenly a very loud commotion of roaring and huts being destroyed followed by screams. Rin is jolted out of her sleep, she grabs her weapons and she runs out side, still in her armor and battle gear. It takes her a minute to grasp the scene as demons fly around destoying huts causing the villagers to come running out of their homes. Rin notices that some people are wearing their armor and some are not any longer. Rin sees a demon going after an older man whom is having trouble running away, she immediately springs into action, grabbing a stone from her tiny stone bag that she keeps near her sash and uses her sling shot, she aims perfectly striking the demon between the eyes. The demon roars loudly, more irritated than hurt by the strike as he sees it was Rin who attacked him and heads for her. Rin, not afraid quickly replaces her sling shot and twirls her Naginta ready to fight. Meanwhile Kohaku is already attacking demons with his weapon also skillfully using it to swipe at a demon's head but the demon moves out of the way, noticing that Kohaku has on an armor, the demon knows that he will not be able to scar him in the spot he needs to. The demon attempts to slash Kohaku with his mighty claws but Kohaku is too skilled and does not allow the demon to get close enough to him, all the while Kohaku continues to strike at the demon with the deadly hook of his Kusarigama, He easily strikes the demon in the arm and as that happens, he allows the chain of his weapon to wrap the demon tight around the arms, immobilizing him. Kohaku asks, "Are you able to speak?" The demon laughs, "Ha, Are we suppose to have conversation now?" Kohaku replies, "That's right. You will tell me what I want to know or you will lose your life here and now." The demon responds, "Fool, I am powerful now, no longer a weak mortal....you can not harm me." The demon is so strong he easily breaks the chain that binds him leaving Kohaku with only the hook in his hand. Kohaku is shocked by this and places the hook back in his sash and pulls out his sword. Though the demon has brute strength he has no powers except the ability to claw his victims and make them become demons that can be controlled but since Kohaku is protected by the armor, the demon can only attempt to attack with his powerful arms and claws. Kohaku wields his sword and eventually slices off the demons hand as the claw falls to the ground the demon roars and Kohaku wastes no time in putting the blade of his sword to the demon's neck and says, "Shall we try this again? I want some answers." The demon snarls. Meanwhile, Rin is also fighting with her Naginta and the demon is also finding it difficult to fight her but still he attempts to swipe his claws but Rin strikes him in the leg. The demon, now very angry grabs Rin's Naginta and he is so strong, he takes possession of it and throws it. Rin has no choice but to use her tiny build to her advantage as she runs and slides under the demons legs causing him to lose her from his view instantly and before he can turn around Rin has pulled another small dagger and stabbed him in the back. He roars and tries to turn around to capture Rin but another demon speaks to him, yelling, "Never mind her, you are wasting time....find a female this time that has no armor." The demon abandons the fight with Rin and begins looking for a female he can have as his next victim. "There, get that girl near the tree!!" The other demon shouts the order before looking for his own victim. Rin looks near the tree and there is a young woman shivering with fear at the tree, it is Chizu. Rin thinks to herself: Why is she not wearing any form of armor to protect herself. She yells out, "Chizu run!!" The demon slowly approaches her and raises his hand to claw the symbol on her chest that has no armor on it but Rin runs as quickly as she can toward the girl and the demon intent on attacking him before he can strike at the girl but as she gets closer to the demon she realizes he is hesitating, holding his arm in striking position for longer than needed. Rin is confused by this but still ready to attack him when something else stops her, Chizu suddenly says, "Brother, It's you!" as she embraces him tightly, not caring of his new horrid demon form. The demon speaks to his sister in a deep, raspy, demon voice, "I can not harm you, no matter what power controls me. I could never harm my little sister. " The other demon comes back and says, "What are you doing!? You know the orders, get her! If you won't then I will." The demon tries to approach Chizu but her brother attacks his clone and they fight powerfully, biting and clawing at each other as Rin tells Chizu, "Run to the hut, get an armor on quickly." Chizu does as ordered while Rin runs to pick up her Naginta that was thrown and goes to save whatever other villagers she can. Kohaku is still with another demon and has a sword to it's throat as he asks, "How do I break this spell and get the humans back to normal?" The demon informs, "You can not reverse it, once the demon transformation is complete it can not be undone. Anyway I have no desire to be human again." Kohaku inquires, "Where is your leader, the head demon?" the demon laughs, "Ha, you can kill me now because I will never tell." Kohaku does just that as he comes down on the demon's head with his sword. All the demons except for Chizu's brother fly off, retreating from the village with no victims this night only leaving some wounded villagers with minor cuts and harmless scratches. Chizu goes to her brother and hugs him asking, "What have they done to you?" He responds, "It doesn't matter now. I feel like a curse has been lifted and I am suddenly myself again. Though it seems I am doomed to remain in this hideous demon form." Rin feels sorrow for the young man and his sister as she responds, "I'm so sorry, I wish there was a way we can return you to human form." Kohaku adds, " The other demon said that it is impossible." The demon agrees, "Yes, sadly there is nothing that can be done for me but I refuse to go back to the head demon, I will live on my own in the Western woods." Chizu immediately jumps in, "I will come with you, We will stay together." Kohaku asks the demon, "Please help us to stop this from happening to anyone else, Tell us where we can find the head demon." He informs, "They can be found in the swampy area of the Southern region, They rest in caves during the day and venture out at night. You will know the head demon when you see him because he is the only one who has demonic eyes that constantly glow red." Kohaku thanks the demon for the information and tells Rin, "Get plenty of rest, We have a long trip tomorrow." The next morning one of the villagers has repaired Kohaku's hook and chain weapon and also provides Kohaku and Rin with a horse that they both share as they ride to the Southern region bound for the swamp area. They have a conversation on there way to the South. Rin tells Kohaku, "I've been thinking about what Chizu's brother said last night about feeling like a curse has been lifted from him." Kohaku asks, "What about it?" She explains, "Well, something caused him to feel that way. I don't know, there may be some way to stop the possession even if there is no way to reverse the entire transformation." Kohaku responds, "I don't know about that Rin." The next day, back at the empire, Heroshya is again with his father as they spar together outside the castle. Sesshomaru enjoys this time with his son and thinks that Heroshya is learning quickly how to wield his sword and fight flawlessly. As they practice, a demon servant informs Sesshomaru that the ruler of the South is present and wishes to speak with him. Sesshomaru instructs Heroshya to come with him, he wants his son to witness how he handles situations that arise with rulers and demons of other empires. Sesshomaru takes place at his throne and orders for the servants to allow the ruler of the Southern region in. The ruler of the South is in true demon form yet looks regal and mighty. The two rulers have never met before but are well informed as they already know each other's names. The ruler of the South speaks, "Sesshomaru, I believe you have my property." Sesshomaru replies, "Indeed I have Masashi, Since you have come here, she must be of some importance to you." He replies, "Not really, I just figured why not use this opportunity to meet the demon who now dominates the Western province. Who knows, our empires may battle in the near future." Sesshomaru agrees, "I look forward to that meeting, however for the time being, I have a question for you. Why were your servants found on the grounds of my empire?" Lord Masashi smirks, "Come now Sesshomaru, all is fair in war and empires...I simply wanted to find out more about your domain. I must admit, I find you strangely interesting." Lord Sesshomaru is curious as he inquires, "Really, Why so?" He responds, "I heard from one of your very own demons that he lost his arm as a punishment for breaking your rule that demons are not to attack human villages." Sesshomaru responds, "Such an occurrence did take place.... but what of it?" Lord Masashi continues, "Well, this must be a difficult decree for some of your demon servants to obey, especially the ones whom enjoy feeding on human flesh." Sesshomaru again agrees, "That would be a fair statement." Lord Masashi has an idea, "Why not let me take them off your hands? You seem to be devoted to these mortals so allow me to take control over those demon servants whom require human consumption." Lord Sesshomaru thinks a moment and proposes, "I will allow you to make an announcement to the demons of my empire, Those who want to go and serve under you are free to leave. You may take them and I will keep your demon spy that I have held captive." Masashi likes this plan and agrees to the terms. He makes the announcement and leaves with 4 of the empire's human eating demons while several others remain loyal to Lord Sesshomaru's command. Heroshya is bewildered and inquires, "Father, We have lost 4 very powerful demons. Why would you make such an agreement with him?" Sesshomaru replies, "They are powerful but have no loyality, therefore they are not worthy of me or this empire. There is no loss here." Heroshya is still not happy with his father's actions as he comments, "You are allowing this human girl to ruin us. She is the reason you protect these humans?" Sesshomaru explains, "Son, I do not keep the human villages safe simply to make Rin happy, there is a deeper reason. Humans do not possess demonic energy and powers such as we do, instead their strengths come from within, Intangible but immense." Heroshya is not convinced, "What strengths could they possibly have?" Sesshomaru continues, "Endurance, Determination,Compassion and Sacrafice. Humans are able to feel and understand emotions that are of significance but that we demons find difficult to feel." Heroshya scoffs, "Forgive me father but that sound ridiculous." he responds, "You will come to see these things on your own, for now...my rule stands. Besides, peace between humans and demons will keep my empire in majestic appearance." Sesshomaru orders his servants to have the female demon spy of the South sent to him; when she arrives Sesshomaru informs her, "Your master Lord Masashi, Demon Ruler of the South was here however it would seem he did not come to retrieve you. Instead he chose to take four of my demons and leave you as a sacrafice." The female demon spy raises her eyes in shock that her master abandoned her as Sesshomaru continues, "You are his faithful servant but he so easily discarded you. I on the other hand admire the way you kept your composure and respect for me while at the same time risking your life to remain loyal to your master. So I will suggest that you serve as my Informant. I believe you can be trusted and reliable." The demon spy replies, "Yes, You have spared my life and you find me worthy. I shall not disappoint you... I graciously submit to becoming your humble and faithful servant Milord." Heroshya sees that the demon is grateful to his father's mercy and immediately became loyal to him, he thinks: Hmmm, I think I see. Lord Masashi gained four demons of low allegiance while father gained one demon who will be a devoted servant no matter what. A simple matter of quantity vs. quality. Father is much wiser than I give him credit for, still I think I will take a trip to the Southern region tomorrow. I want to see for myself if father's order to not attack humans makes any difference at all. Back in the Southern region and once night falls, Rin and Kohaku slowly and quietly creep through the swamp area holding their weapons and waiting for the demons to emerge. They do not have to wait long when 6 demons come flying out but from all directions making loud growling noises as they swoop down at Rin and Kohaku. Rin has her armor on so the demons are not able to claw her but instead they yank at her hair with their claws as they fly past and she swipes her Naginta swiftly at them. As she swings, she does wound the foot of one demon with her sharp weapon causing him to roar loud and furiously. Kohaku also uses his weapon and is able to injure one of the demons. He looks back and can see the demon with the glowing red eyes is getting angry and begins flying at top speed towards he and Rin. The demon is so fast as he suddenly shifts his direction in flight and picks Rin up by the back of her armor, lifting her up off her feet, she mistakenly drops her weapon and is suddenly in the air. Rin screams and Kohaku runs after them as he shouts, "RIN!!" She is struggling and trying to get loose of the demons grip, her arms are still free so she removes her armor that the demon has a hold of which causes her to fall to the ground. Kohaku runs to her, she sits up and he grabs hold of her arms, "Rin, Are you okay??" She tells him, "Yes, I'm okay." Kohaku immediately removes his armor and orders, "Here put this on now." Rin argues, "No, Kohaku..." He interrupts, "We don't have time, Do it Rin !!" Rin quickly does as he tells her and puts on the armor as Kohaku is now vulnerable, this was the demons plan to leave one of them without an armor as he now knows who will be his next victim. He wastes no time in attacking when Kohaku turns around the demon is on him before he can blink and claws the symbol quickly upon his chest. Rin sees this and is horrified as she yells out, "NOOO!!" She grabs her sling shot as her anger and determination to kill this demon is now stronger than ever. She instantly puts three stones at once on her rubber sling and closes one eye to aim perfectly as she pulls the thick band to it's max. She aims directly for the demons head and pulls the band a little more then lets it go causing all three heavy stones to go flying and shooting with extreme force....first stone through the demon's neck, second to the demon's head and third through the arm, piercing it as enormous amounts of blood spray out. The lead demon falls to the earth as Rin runs to Kohaku, he removes his shirt and there is the symbol that has caused each man to become one of those hideous demons. The other now five demons stand by watching and no longer seem to be aggressive but Rin does not concern herself with that as other thoughts run through her head so quickly, she thinks about the demon telling her that once the transformation takes place it's permanent, she thinks about Sango and how she will feel to see her brother in such a state and she thinks about Chizu, now knowing how she feels to have someone she loves transformed into a demon. Kohaku starts to feel pain and his eyes seem to be changing as she suddenly remembers something, Rin wraps her arms around him and holds him tight as she says, "Kohaku, Hold me...Please hold me tight before you transform." Kohaku does embrace her in return thinking this will be the last time he will ever be affectionate with Rin again. As they hold each other tightly Kohaku notices that the pain is subsiding and he is slowly feeling normal again. Rin looks up at him and inquires, " Are you okay Kohaku? How are you feeling?" He chuckles a bit as he say, "Ha, I feel fine." Suddenly the sound of a furious roar coming from behind them as Rin shouts out, "The Head Demon! He's still alive!!" Kohauku pulls his weapon and slashes at it skillfully as the lead demon attempts to block all strikes with his mighty claws but his hand is severed when the blade comes down heavy upon it. The demon is quick to attempt yet another claw strike but it is avoided as Kohaku jumps and maneuvers slitting the demon in half lengthwise with his weapon. The demon falls dead to the ground ; at that very moment, the five demons return to their natural human state as the transformation is completely reversed. Rin and Kohaku are very pleased to see that the spell is completely broken due to the head demon's demise as she replies, " The transformation was reversible after all, we just needed to destroy the head demon." Kohaku responds, "If it was the head demon's death that caused the transformation to be reversed, then why did I not transform earlier." Rin responds, "It's like Chizu's brother said... a curse had been lifted." Kohaku is still confused, "I don't understand." she explains, "Don't you see Kohaku? Strong feelings or love for someone over powers the demonic possession and stops the transformation. When we embraced, those feeling were released and it lifted the curse. Just like when Chizu's brother was ordered to attack her, the love he felt for his sister broke the control the demon had over him." 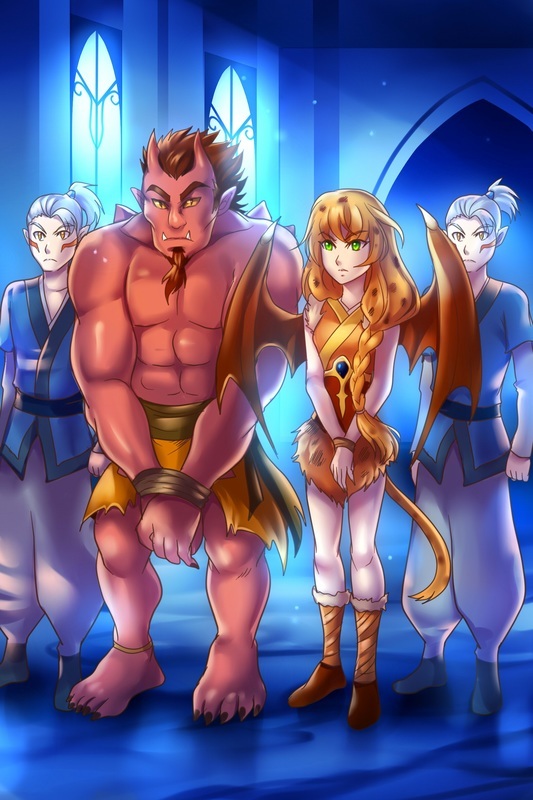 The five humans are extremely happy as they head back to their families and homes in the human village of the Western region, Rin and Kohaku accompany them to the human village and they inform that the head demon is dead and no longer a threat. The villagers are so grateful and feel extreme relief that they are safe again; As promised, they pay Rin and Kohaku a large sum for their services. Meanwhile, Heroshya flies to the Southern lands to observe for himself how the Southern region is controlled. He flies high in the clouds, as he flies lower, the lay of the land starts to come into view. He notices that there are very few trees or flowers, no green meadows or pastures and the area looks to be the scene of a battle as some dead demons and dead humans lie on the grounds of the Southern lands causing a bad stench that is very strong and annoying to Heroshya. He thinks to himself: Uggg, this smell is awful and these grounds are unkempt, why would Masashi allow his kingdom to appear this way? 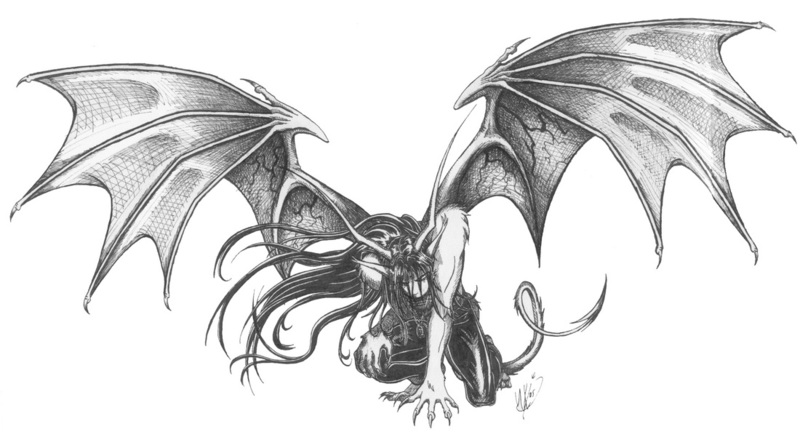 As he flies he sees a demon walking and decides to drop down to speak with him but takes caution in approaching since he is in unfamiliar territory and unsure which demons are hostile. He lowers himself and lands behind the demon yelling out, " Are you a demon of ruler Lord Masashi's empire?" The demon turns and responds, "Whom is asking?" Heroshya responds, "I am simply a demon of another region, exploring these lands." The demon laughs, "If you were going to use that excuse, then you should have worn a disguise young prince." Heroshya is a bit surprised as it never occurred to him that the demon would recognize him as the son of Lord Sesshomaru. The demon inquires, "What could you possibly want in these awful lands?" Heroshya repeats, "It is as I've stated, I wanted to see what this region was like and I now see that Lord Masashi cares nothing for his own land." The demon explains, "That is not so young prince. He loves his land it's just that he's not a very wise ruler." Heroshya is curious, "What do you mean?" The demon continues, "The humans hate Lord Masashi and the demons of his empire, actually the humans here hate all demons because Lord Masashi allows his demons to attack and terrorize humans at will. Long ago, the humans here grew tired of this treatment and waged war against all demons. They've gathered their demon slayers and warriors and they fight demons that even try to invade their territory. Not only that but they refuse to treat the grounds outside of the human villages; only keeping their areas full of beautiful trees, flowers and medicinal plants. We... being demons, have no knowledge of growing trees and flowers or seeding to create medicinal herbs or plants that we demons also need to help heal us from illness or certain poisons." Heroshya responds, "I see, but the Eastern ruler...Lord Zeref , he allows his demons to attack humans also but yet his land does not look like this." The demon explains, "Lord Zeref is much wiser and more calculating than Lord Masashi. You see, Lord Zeref is aware that he needs the humans to keep his lands in good shape, also to plant those medicinal herbs and plants we demons also require, so he allows only the demons that reside in the Eastern lands and living outside the castle grounds to do what they want with humans but the demon servants of his empire that live within the castle grounds.... he orders them to avoid the human villages of his land and attack as many human villages they want in other lands such as the West, North and South. This way the humans are fooled into believing that Zeref is protecting them as they are not bothered by demons very often..it is a rare occasions that the human villages are attacked and since they are not overwhelmed by numerous amounts of demons, this stops the human population from diminishing and with that, they continue to keep Lord Zeref's lands in order" Heroshya is understanding clearly now of his father's actions and he thinks to himself : Perhaps I should take serious heed to my father's words and advice from here on If I am to become ruler of the Western Empire someday. Now that the demon slaying mission is over, Rin knows exactly what she wants to do with the money that she has earned. Two days later, it is early morning and Rin is dressed in a pretty Kimono preparing to visit with Lord Sesshomaru on this, their usual day. She greets Lady Kaede with a nice breakfast as she gives her a big hug and says, "Good Morning Granny. I made you breakfast and I have something for you." Rin pulls out a beautiful bunch of flowers for her. Lady Kaede replies, "Rin, how beautiful." Rin tells Kaede, "That's for being so understanding about my demon slaying jobs. I also purchased plenty of food to last us quite a while." Kaede looks at all the food in their cubbard and asks, "You bought this with your money from demon slaying?" Rin replies, "I sure did, I also bought Lord Sesshomaru a wonderful gift, I hope he likes it. I'm off to see him now, I'll be back soon Granny." Rin runs off carrying a package she can not wait to give to Lord Sesshomaru but when she sees him she decides not to give it to him right away realizing he will also want to know where she got the money to pay for the gift. They talk at the lake for a long while when she can not hold out any longer, she says, "Lord Sesshomaru, I have something for you." She gives him the package and he opens it to see a gold and black sash made from a very rich, silk material. Lord Sesshomaru can not help but wonder and he asks just as she expected, "Rin, how are you able to pay for a sash made of such material?" She replies, "Well, I assure you I did not steal it Milord." Sesshomaru still inquires, "Then, how?" she does not look at him and she is slow to give her answer thinking to herself: I won't lie to Lord Sesshomaru but I can't tell him I've been demon slaying. I'd better choose my words carefully, she tells him " I earned money by working for the villagers." He thinks to himself: Hmmm, so... she is careful not to tell me what kind of work she did for the villagers, she must be demon slaying. That is the only explanation for her being able to purchase such a gift for me. I can say nothing about it, she is a woman now...I can't stop her from doing what she wants. Rin asks, " Do you like it?" He informs, " Yes, I will wear it my next visit." He places a hand on her cheek and says, "Rin..." she replies , "Yes." he thinks: I want to tell her to stop demon slaying, I could not bare it, if she were to be killed. Instead He finishes his sentence, "It is a fine Sash." She smiles and rests her head on Sesshomaru's shoulder thinking that he is still unaware of her demon slaying jobs unbeknownst to her that he knows.